Beauty Costs > How Much Does a Peridot Cost? How Much Does a Peridot Cost? A peridot, often referred to as chrysolite, is a gemstone known for its natural color of olive green and is one of the few gemstones that occur in only one color. Because of its characteristics, this stone is often mistaken as an emerald. This stone is found in rocks created by volcanoes or even some meteors that fell to earth. A peridot can be sold attached to a piece of jewelry or sold individually as well. The price of this gemstone depends on the color, the quality, where the stone was mined and the jeweler selling the gem. On the market, you will find the values are going to vary quite a bit. On average, a high-quality peridot stone can cost anywhere from $50 to $200+ per carat. Larger peridots that are exported from foreign countries can cost as much as $500+ per carat. Generally, stones mined from Burma, Pakistan and Arizona can command the highest prices. Poor quality peridots are going to cost less than a higher quality, but do keep in mind that poor quality peridots are more common than you think. Be sure to look for a pale color or even a tint of brown color as these are usually not that attractive if you look at it closely. Higher quality ones will be more colorful. Jewelry, such as a necklace, a ring or a pair of earrings, can cost anywhere from $15 to $300 depending on the size of the peridot. For example, the natural 6MM 0.85ct Solitair Pendant can retail for $45 to $125, while this pair of 1 carat earrings could retail for $25 to $75. Most rings with peridot stones can cost $99 to $300 on average. According to Gem Society, the vast majority of peridot will produce a sub-carat sized stone of commercial quality, often in the one to four-carat range. The website says custom cuts may command $40 per carat or more, while those much larger than four carats could be valued in the $100 to $150 per carat range. Peridots can be bought in their raw form, while there are some sold already attached to different pieces of jewelry such as a necklace or a pair of earrings. Expect the gem to come in a shade of green, and the iron content in each gem will determine the green color. Usually, the more iron that’s present, the darker the color will be. Peridot is one of the few gemstones on the market that only comes in one color. If you find it in another color, such as black, then it has been chemically treated. Occasionally, this stone can be treated with a colorless oil or a resin to reduce the visibility of inclusions and/or to improve the clarity. Options are available if you want to have this gemstone attached to a specific piece of jewelry. Peridots are commonly purchased separately and later attached to pieces of jewelry such as pendants or earrings. The cost to set your stone will depend on the prong/bezel set and design you choose. Gemstones that are transferred from foreign countries can cost significantly more than those that are purchased within the United States. This gemstone is the birthstone of those who were born in the month of August. Although the stone can come in a variety of green shades, always check the consistency throughout its body. Inspect the sides under different levels of light to make sure the colors match. Its refractive index is 1.64 to 1.70, and the hardness is 6.5 to 7. While the stone can be cut, some jewelers have a difficult time doing so because of the fragile rough crystals inside. Common cuts found include round, antique, oval and emerald. The name is derived from the Greek word “Peridona,” which means giving plenty. Emerald stones are peridot stones are two of them. Even though both of these gemstones are green in color, you may notice a similar resemblance; however, there are some differences you should know about. 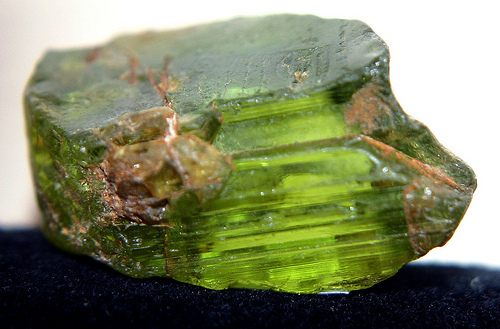 For starters, peridot is a variety of olivine, which is considered a silicate mineral. Emeralds, on the other hand, are a green variety of Beryl. The most obvious difference is actually the color. An emerald will be a deeper green color, whereas a peridot will be green but lighter in color. As for its hardness, peridot is much more fragile than an emerald stone. On the Moh’s scale, an emerald is rated as a 7.5 to 8, while a peridot, as mentioned earlier is a 6.5 to 7. Because of this, a peridot is considered to be more delicate and softer than an emerald. Peridot is primarily mined in the United States, Egypt and Myanmar, while most emeralds are found in Columbia and Zambia. Lastly, in terms of price, there are many factors that affect both peridot and emeralds. The cost of each will depend on the origin, rarity and composition. Peridot stones, on average, will be much cheaper than an emerald in its raw form. Peridot can start at $10 per carat, while emeralds can be more. AJ’s Gem says that buying a loose gemstone instead of a pre-set can often be the best value since loose stones will almost always be the cheapest option, plus you will get to see up close what you’re really paying for. With some pre-set jewelry, some jewelers may hide the imperfections inside the piece or even deepen its color. Be wary of those that are charging too much or even too little. If you want to get a second opinion on the peridot, it doesn’t hurt to meet with a certified jeweler to see what their opinion is.